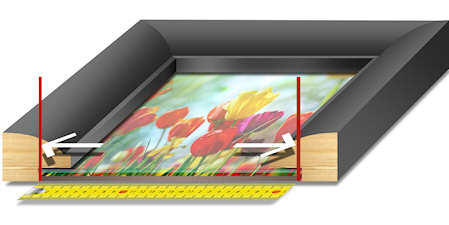 The size of a picture frame is the ‘ INTERNAL ‘ size of the frame – figure 3 below. 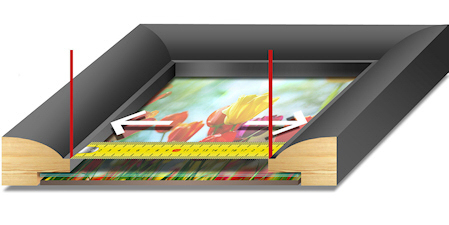 1mm to 6mm is added on to the size of the picture frame, this is the frame tolerance. 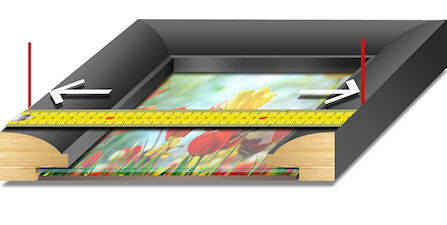 the inside size of the frame will be 101mm – 106mm – figure 3 below. 1.The outside to the outside ( external ) size of the frame is incorrect. 2.The inside to the inside ( sight ) size of the frame from the front is incorrect. 3.The inside to the inside ( internal ) size of the frame from the back is correct. The edges of the item inside the frame will be covered by the width of the rebate.